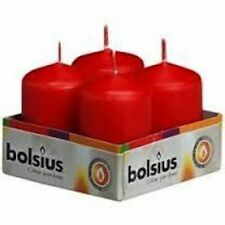 WHOLESALE BOLSIUS IVORY, RED OR WHITE FLOATING CANDLES - 20 PACK 5HOUR BURN!! 20 x Premium White Floating Candles. 5 out of 5 stars - WHOLESALE BOLSIUS IVORY, RED OR WHITE FLOATING CANDLES - 20 PACK 5HOUR BURN!! 26 product ratings26 product ratings - WHOLESALE BOLSIUS IVORY, RED OR WHITE FLOATING CANDLES - 20 PACK 5HOUR BURN!! 20 x Ivory White Floating Candles. 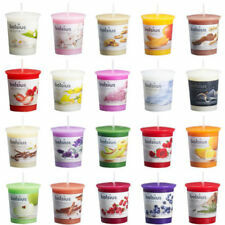 BOLSIUS 8 HOUR LONG BURN TEA LIGHT TEALIGHT UNSCENTED CANDLES - BULK BUY! 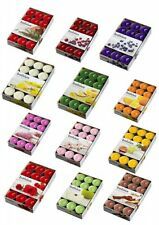 PREMIUM BOLSIUS IVORY FLOATING CANDLES, 20 PACK 5HOUR BURN TIME - GREAT VALUE!! PREMIUM BOLSIUS IVORY FLOATING CANDLES. These are ideal for weddings or party centrepieces. 5 out of 5 stars - PREMIUM BOLSIUS IVORY FLOATING CANDLES, 20 PACK 5HOUR BURN TIME - GREAT VALUE!! 7 product ratings7 product ratings - PREMIUM BOLSIUS IVORY FLOATING CANDLES, 20 PACK 5HOUR BURN TIME - GREAT VALUE!! Bolsius Ivory Pillar Candle 300x100mm – product information. – Size (approx.). High quality, low smoke and drip free pillar candles. – Colour: Ivory. A stylish decoration perfect for creating warm and inviting atmosphere in every interior. 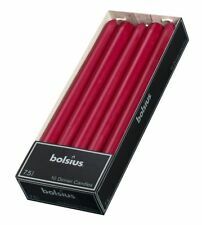 Bolsius pillar candles are red in colour. IDEAL FOR CHRISTMAS DECORATION. Need it in a hurry?. 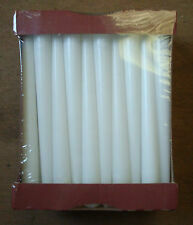 WHOLESALE BULK PACK OF 24 BOLSIUS IVORY 60mm x 40mm CHURCH PILLAR CANDLES 7HOUR! Clean burn, no smoke. Great candles for small hurricanes and fish bowls. Each candle is60mm tall x 40mm wide and perfect for smaller holders like votives or glass bowl decorations for centrepieces etc. You can find all these qualities in our new tealight concept because Bolsius tealights Leave minimal residue in the cup after burning. Can be lit more than once without problems. 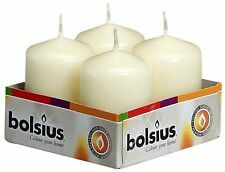 Bolsius Professional Tealight Candles. High quality, low smoke tealight candles with a professionalperformance. minimum residue in the cup after burning. Especially popular for use with. Colour - White. BOLSIUS BAG 50 8HR TEALIGHTS. Ideal for use in oil and wax tart burners. Long Burn 8 Hours. Material: Wax & Aluminium Cup. Perfect for events or long evenings. Size: W4cm x H3cm x D4cm. BOLSIUS 50 WHITE NON-DRIP TAPERED DINNER CANDLES, 7.5Hr BURN TIME! BULK BUY! Box of 50 Tapered Candles - 5x10 Candles. Each candle is 25cm tall with a width of 2.2cm to fit standard dinner candle holders and candelabras. For Bulk or Wholesale Orders. 5 out of 5 stars - BOLSIUS 50 WHITE NON-DRIP TAPERED DINNER CANDLES, 7.5Hr BURN TIME! BULK BUY! 2 product ratings2 product ratings - BOLSIUS 50 WHITE NON-DRIP TAPERED DINNER CANDLES, 7.5Hr BURN TIME! BULK BUY! Our range of unfragranced church candles feature a high quality finish and are available in ivory and white. Made from parrafin wax. A stylish, attractive floating candle in a beautiful shade of ivory. PACK OF 30 BOLSIUS SILVER CANDLE FITTINGS CANDLE GRIPS - IDEAL FOR CANDELABRAS! Box of 30 Candle Fittings - Ideally used for candelabras. Box of 30 Candle Fittings. Solid ivory candles. Taper style. 100 candles per box. Elegant candles for candlesticks. £0.31 per candle. 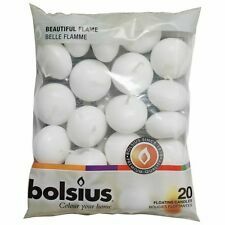 120 PREMIUM BOLSIUS WHITE FLOATING CANDLES, 6 x 20 PACK 5HOUR BURN TIME!! 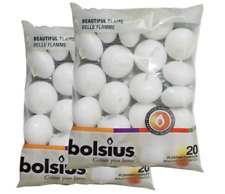 120 PREMIUM BOLSIUS WHITE FLOATING CANDLES. These are ideal for weddings or party centrepieces. 68mm x 190mm - 6.8cm x 19cm. 68mm x 130mm - 6.8cm x 13cm. 68mm x 80mm - 6.8cm x 8cm. 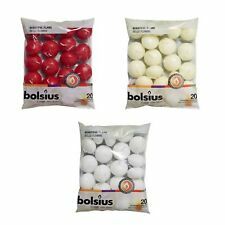 BULK BUY - BOLSIUS BALL CANDLES 70mm - 3 COLOURS - HOME OR EVENT DECOR! Bolsius XXL 3 wick Candle, 20 x 15 cm , "Ivory"
Bolsius Extra Large 3 wick Candle, 15 x 15 cm "Ivory"